QTU members in almost one hundred schools undertook a ban of NAPLAN Online in May 2018 to draw urgent attention to the need for a review of NAPLAN and MySchool at a federal level and to call on the Queensland Government to implement a review of the impact of NAPLAN in Queensland schools. QTU members were successful; the Queensland Government has committed to a full review of NAPLAN, and other states and territories may follow Queensland’s lead. The Education Council also recently determined that a review, albeit narrowly focusing on MySchool and the reporting of NAPLAN data, will be undertaken. The federal opposition has announced that should it be elected, it will undertake a broad review of the test. The QTU maintains that the NAPLAN testing regime has had its day, but while the test continues to exist, QTU State Council in May called upon the Department of Education to agree to negotiate a joint statement with the Union bringing about real change at a central, regional and school level with regard to the undesirable practices surrounding NAPLAN that impact on QTU members and the way you do your work. QTU Executive met in late June to consider a report on actions taken by the Department of Education and the state government in response to QTU members’ ban of NAPLAN Online in 2018, including the commitment from the Education Minister Grace Grace to the review of NAPLAN in Queensland schools. 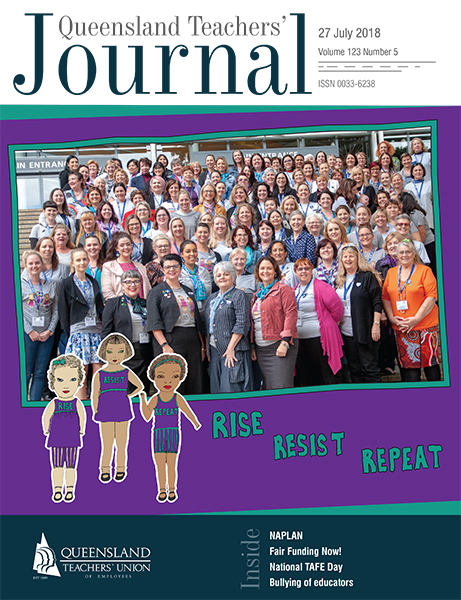 The QTU was involved in consultation regarding the terms of reference for the review (https://qed.qld.gov.au/programs-initiatives/education/naplan-2018-review) and agreement was reached to commence negotiations for an enforceable joint statement, a draft of which will be presented to QTU State Council in August. the QTU NAPLAN Online ban be lifted in relation to preparation activities required to be undertaken by the Department of Education and the QCAA relating to NAPLAN Online in Semester 2, 2018.
participation of QTU members in NAPLAN Online in 2019 will be subject to the successful negotiation between the QTU and the Department of Education of a joint statement on NAPLAN and the commitment of the government to act on the findings of the review. school and platform readiness testing/trialling - to take place between August and November. The Union now turns to ensuring that the voices of QTU members are heard loud and clear in the review being undertaken across Queensland in semester two. It is also important that, if the QTU is successfully able to negotiate a joint statement with the department that commits the parties to addressing the undesirable aspects of the NAPLAN testing regime, the contents are enacted in schools as a matter of urgency. NAP trials are also taking place in a limited number of schools across the state in 2018. The QTU notes that participation in NAP activities is an obligation for the government school sector under the National Education Agreement between the Commonwealth and the states and territories, and an obligation for the non-government sector under Commonwealth schools funding legislation and funding agreements. Individual schools which are sampled may negotiate to be excluded from the sample if there are extenuating circumstances.